Armed bandits who stormed Dogon village of Tsafe Local Government Area, and Birnin Yero of Shinkafi local authority of Zamfara State on Sunday, killed three Civilian JTF, religious leader and 6 others and also kidnapped 3 women. The armed bandits who were said to be about 10 men, stormed the villages and began to shoot sporadically in every direction which led to the death of nine people. 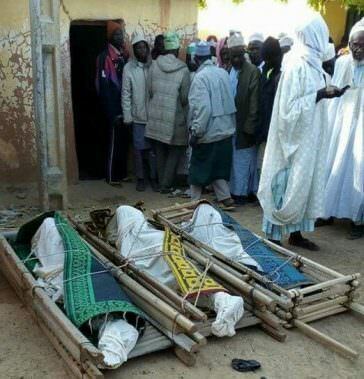 The gunmen who also rushed into the mosque in the village and killed one religious leader, Mallam Ibrahim Dan Kurya, who was offering his prayers, searched his pockets and took his handset which they used in calling his son, telling him that his father had been killed and that he should go and take him away for burial. The village has long been deserted as the villagers fear the armed bandits might return. Spokesperson for Zamfara State Police Command, SP Shehu Mohammed, who confirmed the incident told newsmen that armed policemen had been dispatched to the area to arrest the armed bandits and prosecute them for their notorious activity. 3 civilian JTF and three House wives of former vice chairman of Shinkafi local government malan Bello Muhammad B/Yaro, of Zamfara state were also kidnapped in a similar attack which took place in Birnin Yero village, Shinkafi Local government.